Once again, I'm really falling behind on my blog entries, I'm gonna try to get one up every day for a few days to get everyone up to date. 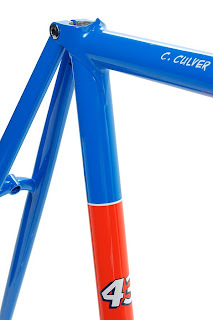 Chad contacted me last summer and wondered if I could make him a steel triathlon frame that would be unique and not just a cookie cutter version of all the typical carbon tri frames. Well, even with a simple paint job, this frame would stand out, but Chad took it one step further and had Jason paint it the classic Richard Petty NASCAR scheme. Honestly, the photos don't even do the orange justice, it's full on day glo! 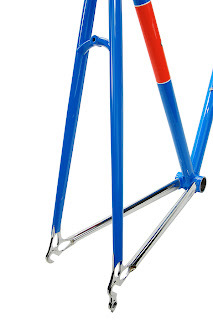 In addition, we went with polished 953 chain stays and a chromed fork. 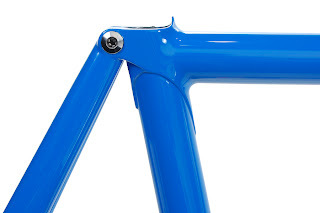 If you look back through the blog, you'll see some shots of the raw frame and the bi-laminate lugs for the head tube and seat lug. 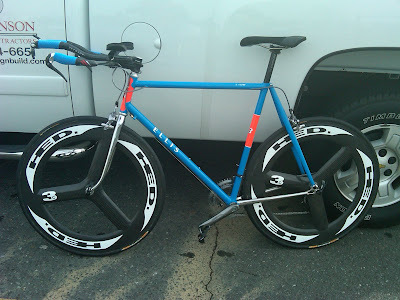 Jason added Chad's name on the top tube so just in case there's another Richard Petty tri frame out there! A shot of the bi laminate seat lug and huge aero seat stays attached as a fastback. Chad already got the frame built up last Sat., it's an interesting mix of modern and classic looks. 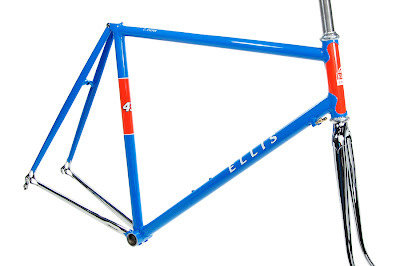 If you stop my the Ellis booth at NAHBS in Richmond, Chad's bike will be on display, you can't miss it! That is soooo cool! As a kid, back in the '70's, I was a huge Richard Petty fan. It's funny how many people who've seen that bike immediately know what the color scheme is. Usually the last person who I'd pick out as a Nascar fan. Go figure? I hope he gives us an update of how his time (and conversations) improve now that he is Tri-ing on an Ellis bike. Dave's (that's me) Show bike!